DUNDALK WILL BE hoping to maintain their title push away to Derry City in the SSE Airtricity League Premier Division this evening (KO 7.45). The Lilywhites are in excellent form, having won their last seven league games on the bounce, though they remain a point behind table toppers Cork City, who play Bohemians at Turner’s Cross tonight. Speaking to Dundalk’s official website ahead of the game, recently-crowned player of the month Sean Hoare said he was satisfied with the team’s recent displays. “We are getting into good habits now. We are playing good football and we are into a good rhythm of winning matches. We have won seven on the bounce in the league and that is what we wanted. He continued: “The break is coming at a good time and it is giving us all a chance to rest up and recharge. It is a good thing to have the break but we are focused on the game tomorrow evening. We know it won’t be easy in Derry. Stephen Kenny’s side welcome back Chris Shields from suspension for the game, though they will be without the injured Stephen O’Donnell (broken leg) and John Mountney (medial knee), while Karolis Chvedukas (ankle) is doubtful. 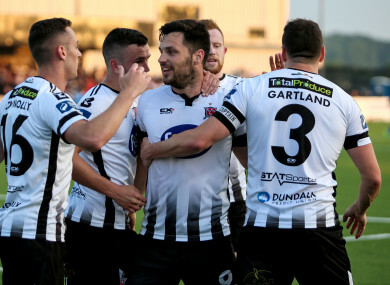 The sides have met twice already this season, with the first game at Oriel Park ending in a 2-2 draw, while Dundalk earned a comprehensive 4-1 win at the Brandywell last month. After a difficult run of form, Derry earned a morale-boosting victory over Bohemians at Dalymount Park last week. Yet with the recent departure of Ronan Curtis to Portsmouth, coupled with the suspension of Nicky Low as well as Jamie McDonagh and Gavin Peers being injury doubts, Derry will not be at full strength for the game. “We’re struggling a bit to be honest,” City boss Kenny Shiels said ahead of the game. With Derry aiming to push for a European spot as the second half of the season approaches, Shiels added that the side were hoping to make four signings in the next few weeks with the transfer window set to re-open. Email “Title-chasing Dundalk aiming to make it 8-in-a-row”. Feedback on “Title-chasing Dundalk aiming to make it 8-in-a-row”.